We were proud to be part of two sessions at the California Association of Teachers of English conference March 9-11. Thanks to all who joined us, and for those who could not come in person, here’s a taste of what we shared. 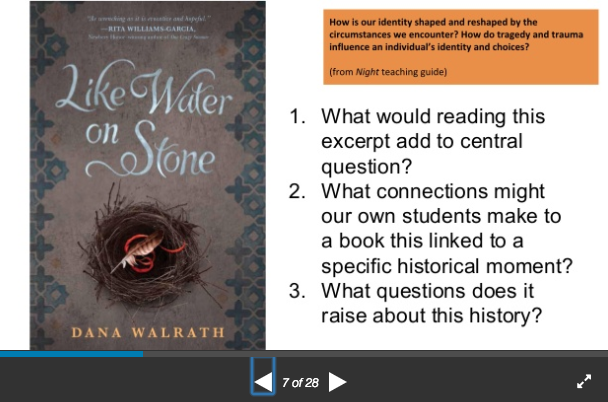 Literature can humanize history while the right non-fiction texts can deepen and extend understanding and relevancy to today. This session will feature the pairing of fiction and non-fiction to explore questions like, How is our identity shaped and reshaped by the circumstances we encounter? How do tragedy and trauma influence an individual’s identity and choices? Pairings include All American Boys and Facing Ferguson, The Absolutely True Diary of a Part Time Indian and Stolen Lives, Like Water on Stone and the Armenian genocide. Our literature series this year has been a great opportunity for exploring these titles one at a time, and there is one left! 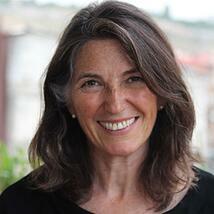 Join us on April 10th for the beautiful verse novel, Like Water on Stone, with author, Dana Walrath. Register for the teacher discussion here. Or, bring your students and/or family and community members to the public (free) event at The Last Bookstore, in downtown Los Angeles. And do you have pieces of literature you like to pair with nonfiction? Share them in the comments below! Empower students with a literary and historical exploration of Japanese American incarceration, featuring resources from the Japanese American Museum, a newly revised teacher guide to the classic memoir Farewell to Manzanar from Facing History, and the story of Fred Korematsu, retold in a new book for young adult audiences by author Stan Yogi, (also co-author of Wherever There's a Fight). With these resources, build a unit for elementary, middle or high school students that deepens historical understanding, builds empathy, and motivates standing up to injustice. 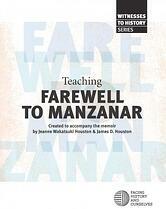 Download our study guide and see other resources for teaching about Manzanar here. See other titles in our “Witness to History” series here. To see the lesson plans Stan Yogi mentioned in relation to Fred Korematsu Stands Up, or to request a classroom visit from Stan and his co-author, Laura Atkins, click here.